If you're in need of a compact speaker to play big sound throughout your home, then the Sonos Play:1 All-in-One Wireless Speaker is for you. Whether you're listening to your iTunes library in your bedroom or browsing one of the 100,000 pre-loaded radio stations in the kitchen, the Play:1 delivers full, powerful sound that fills the room. It produces clear, detailed sound at all volumes. No room is too small for a home audio upgrade. Show some love to those comfortable spaces in your life with the Sonos Play: 1 wireless music streaming speaker. This self-powered, wireless speaker is perfect for smaller spaces or for filling your home with sound in every room — but it has enough power to rock you, your guests and your neighbors (you might just want to give them a heads up, first). The Sonos Play: 1 All-In-One Compact Wireless Music Streaming Speaker streams audio from more than 30 music streaming services. This means you can listen to what you want, when you want, including Spotify, Pandora, iTunes Audiobooks, Podcasts and much more. You can even check out terrestrial radio through the iHeartRadio app. No matter what you listen to, the Sonos Play: 1 produces a dynamic and powerful soundstage that brings your favorite songs to life. Whether you want to create a traditional stereo setup or want to fill a room with theater quality surround sound, Sonos makes it easy for you to build the audio system of your dreams, one speaker at a time. You can wirelessly connect your Play: 1 to another Play: 1, or pair it with a Play: 3 or Sonos Play: 5 for true stereo sound. For deeper bass, wirelessly connect to a Sonos SUB. You can even connect all of your speakers to Sonos PLAYBAR to create a true 5.1 surround sound system. Don’t be fooled by its size. The Sonos Play: 1 is a sonic powerhouse. It is loaded with two individually amplified speakers that deliver crisp, clear highs, full mids and deep and accurate bass. The Sonos Play: 1 wireless speaker features Trueplay technology. This piece of sonic technology lets the Play: 1 analyze the layout of your room and adjusts the way it produces sound based on room size and shape, furniture placement and even pictures on your wall. All of Sonos wireless speakers connect to your Wi-Fi network to create a dedicated network for uninterrupted playback. For situations where your router is too far away from your speaker, check out the Sonos BOOST to create a dedicated network that ensures peak performance. Add a Sonos speaker to each room, and you can fill your entire home with your favorite tunes. Download the free Sonos app from the Google Play Store or Apple App store and take control of all your music. This free app lets you pick what you play, where you play it and how loud you want it to be played. With the Sonos app, make playlists from your own music library and multiple streaming services. You can program what songs you want to hear and what speakers you want to hear them played through. You can even check out artist bios, reviews and concert listings. Oh, the possibilities! Sonos-Designed: Hardware and software custom-designed by Sonos to produce rich, powerful HiFi sound thats crystal clear at any volume. Amplifier: Two Class-D digital amplifiers perfectly tuned to match the speakers and acoustic architecture. Tweeter: One tweeter creates a crisp and accurate high frequency response. Mid-Woofer: One mid-woofer ensures the faithful reproduction of mid-range frequencies crucial for accurate playback of vocals and instruments, as well as delivery of deep, rich bass. Stereo Pair: Turn two PLAY: 1s into separate left and right channel speakers to create wider, bigger, and deeper sound. 5.1 Home Theater: Add two PLAY: 1 speakers to PLAYBAR and SUB for a true surround sound experience. Audio formats supported: Support for compressed MP3, iTunes Plus, WMA (including purchased Windows Media downloads), AAC (MPEG4), AAC+, Ogg Vorbis, Audible (format 4), Apple Lossless, Flac (lossless) music files, as well as uncompressed WAV and AIFF files. Native support for 44.1kHz sample rates. Additional support for 48kHz, 32kHz, 24kHz, 22kHz, 16kHz, 11kHz, and 8kHz sample rates. Note: Apple "Fairplay", WMA DRM and WMA Lossless formats not currently supported. Previously purchased Apple "Fairplay" DRM-protected songs may be upgraded. Music services supported: Sonos works seamlessly with most music services, including Pandora, Spotify, Deezer and Soundcloud. Operating systems (for stored files): Sonos works seamlessly with most music services, including Pandora, Spotify, Deezer and Soundcloud. Multi-language Support: Sonos System Software supports : Danish, Dutch, English, French, German, Italian, Japanese, Norwegian, Simplified Chinese, Spanish, Swedish and Brazilian Portuguese. Easy to install, use, and great sound. Very, very good speakers. sound quality is outstanding! I would highly recommend these speakers. I will definitely buy a few more for other rooms in my house. What can I say it is a Sonos! Plug it in, link to your Sonos system and it works, always! World wide Stereo is absolutely the best. Their customer service is amazing, the personal care and technical expertise is far superior to the make shift hit-or-miss Geek Squad team. I will never go anywhere else even now that I live in California, I will always buy from WWS always. Thank you for making me always understand and know that I am buying the right technology for my needs. This was my second purchase. We wanted music throughout the house so I bought 4 and they are excellent. Expanding sound to the garage. 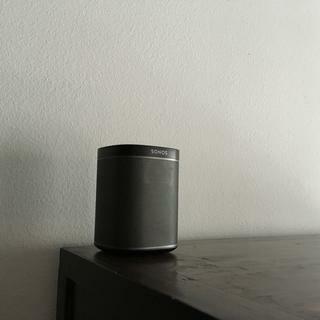 Love Sonos system and have throughout the house. MY OFFICE NEEDS A MUSIC SYSTEM THAT IS WIRELESS AND ABLE TO COMMUNICATE IN ALL ROOMS WITH MY PANDORA SYSTEM.. SONOS HAS THAT ABILITY TO WORK WITH MUTUALITY SONO PLAY 1 SPEAKER AND PLAY ON SITE ON EACH AT THE SAME TIME.. IM LOOKING FORWARD TO SEE HOW IT DOES.. I heard wifi connection has a better sound quality. This unit has that, with alot other features I liked. I've got a Sonos system and it took way too long to take the plunge. You get what you pay for. Easy to set up, no wires and it sounds amazing! Matches my other two and I'm satisfied. Can I mange that each speaker can play separately and when I want can play all 6 together? Each speaker can play different music or any combination can play the same music.